The grill is a terrific, versatile outdoor oven. And similar to an indoor oven, it’s not just for the carnivores among us. 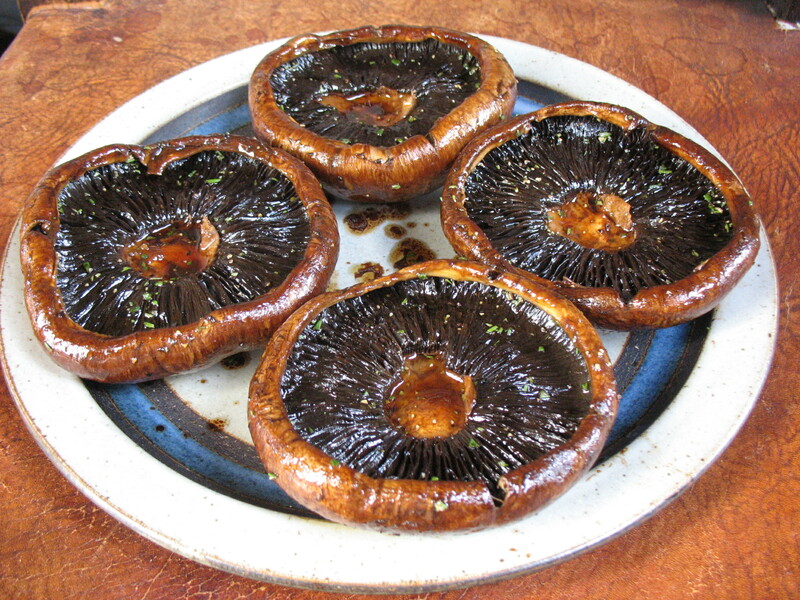 Big, sturdy portobello mushrooms are fabulous grilled, and even better with a bit of olive oil, vinegar and herbs. Topped with savory, melty cheese? Wow! It’s umami in full bloom. I use fresh rosemary for this recipe, but sage is very good as well. Place two to three fresh whole leaves on each mushroom. A sprinkle of either herb dried, is also tasty. Herbs add yet another layer of deliciousness to this super easy recipe. Use small portobellos, often called baby bellas, for convenient appetizers. Or cut the large mushrooms into strips or quarters for appetizers. TIP: The best way to store mushrooms in the fridge is in a brown paper bag. It’s best not to clean them first, but either way, paper is ideal. The mushrooms will stay dry, fresh and firm for days. Don’t store in a plastic bag or you’ll have slippery, soggy fungi. Stir together olive oil, rice vinegar, soy sauce, rosemary and salt in a small bowl or 1-cup measuring cup. Wipe mushrooms with a damp cloth or damp paper towel; remove stems. Place mushrooms, gills side down, on a plate and brush caps with marinade. Turn mushrooms over and brush gills generously with marinade. Let stand 10 minutes. Meanwhile, preheat grill for medium direct heat. 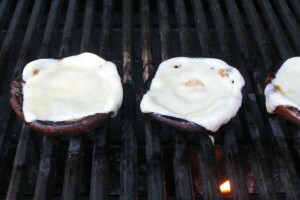 Place mushrooms on hot grill, gills side down; brush caps with more marinade. Close cover and cook 4-5 minutes. * Turn mushrooms over; cook 2-4 minutes more. Place a slice of cheese on each mushroom. Close cover and cook until cheese melts, about 2 minutes. Mushrooms that are not real fresh will cook in less time than the 6-9 minutes stated in this recipe. They will still taste great however. For smaller mushrooms: Grill 2 minutes with gills side down. Turn mushrooms and cook 1 minute more. Top with cheese; cook until cheese melts. 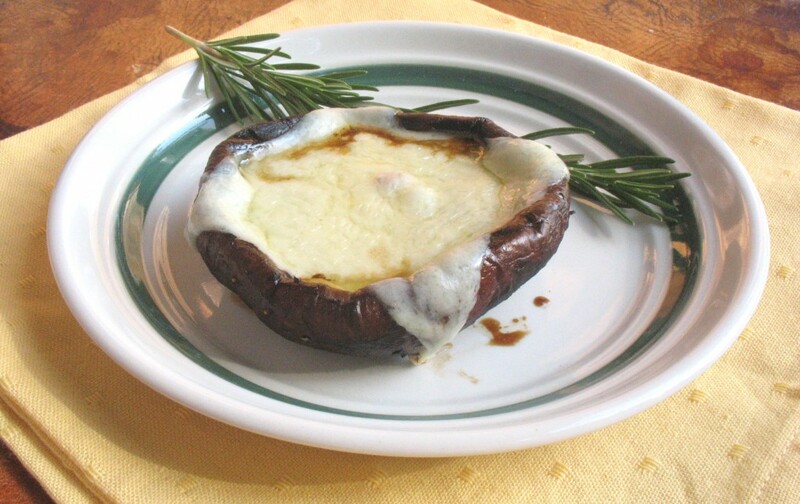 To cook mushrooms in the oven: Preheat to 375°F. Place large marinated portobellos on a rimmed sheet tray, gills side up. Bake 4-5 minutes depending on thickness of mushrooms. Top with cheese; bake 1 minute more or until cheese melts. Sure, add a bun and you have a mushroom “burger.” Though, if I wanted to make a sandwich out of this I would use two slices of nice French or Italian bread. Yet, I prefer to eat these portobellas with a knife and fork as you would a steak. I can’t wait to try this recipe…love everything in it. Rita, I really like the rice vinegar and would you believe I had never used it before. Thanks. Rice vinegar is quite versatile because it’s so mild – just 4 percent acidity. Rita, I love the idea of using the BBQ as an oven. At first I thought you had a special BBQ, but now I understand we can all do this,……as if our own BBQ is an oven. Thanks for this tip !! Marianne, I have a Weber gas grill that has a temperture gauge on the outside. So I sometimes think of my grill as an oven. Plus, living in the SF Bay Area where outdoor cooking is year-round option, the grill really can be used like an oven—for meats and veggies especially.